Over the last few years a quiet revolution has been taking place. The resurgence of relatively low powered valve amps has forced speaker manufacturers both specialist and major, to increase the efficiency of their products. Whereas twenty years ago speakers with efficiency's over 90 dbl were rare, now we have an embarrassment of riches. This is all well and good for the valve brigade, but it opened other doors, principally the birth of specialist low-powered transistor amps. 20 years ago the idea would seem insane, the whole point of transistors was that they could produce cheap power and drive inefficient speakers - spend more and you got more watts - simple. But when you only needed a few watts to drive your high efficiency speakers why bother making 200 watt monsters? More importantly if the need for watts was removed could something special be done with transistors? The other development was 'amp on a chip' integrated circuits, where all the circuitry for an amp could be crammed onto a single piece of silicone. Great for portable stereo, tv's, computer systems etc. But these little chips, often designed for low-power, mass-market applications had some very interesting characteristics. Assuming the basic circuit was good they offered vanishingly short signal paths and no soldered joints just for starters. 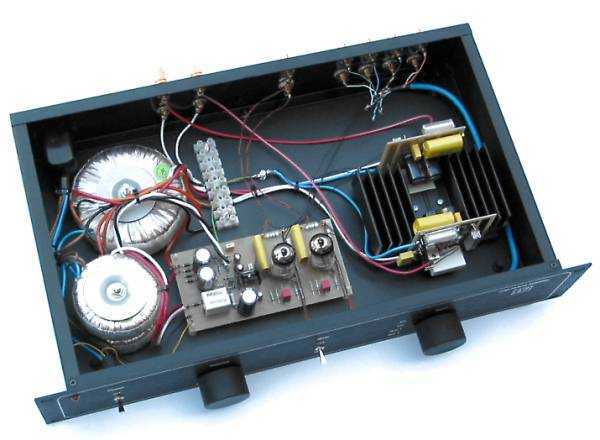 And so some enterprising types tried to make a high-end amp from them, the most famous (but not the first) being the Lab47 'Gaincard' that I reviewed a couple of years ago. And the JLTi integrated? -Well after that rather rambling introduction I suppose we'd better get onto the item under review! Well first it's no 'Gaincard!' Here we have a full-width, rack-mount case. It's a proper integrated with four inputs, volume control and interestingly a pre-out as well. The reason for the latter item is that unlike the Gaincard this integrated has a proper pre-amp stage, not only that, it's a valve stage, based around a pair of 6922 signal valves. This then drives the transistor power-amp stage - so the JLTi is a hybrid. Opening the box you see the discrete valve stage, and three surprisingly big torroidal transformers and the IC based power amp. It's a fair collection of bits and I'd hazard a guess that the parts cost might even be higher than for the far more expensive Gaincard? When funds allow the amp can be upgraded. As the little thing has a decent valve pre-amp this allows you to enjoy the pleasures of valve swapping (Joe sent me some NOS valves to try that made a subtle improvement). And as the valve pre can be split, the upgrade could well involve adding another power-amp stage for biamping, or a different power-amp - once you've got the thing in your system it won't let you get rid of it easily. "Parts selection is always a contentious issue with audiophiles who often peep at the inwards of amps. It is also a major hit on the final cost that is presented to the buyer. The JLTi uses money where it matters and it contains a series of small but significant parts discoveries, making savings at no cost to the sound. One is a Volume Pot that looks inexpensive (and is) but is actually minor miracle. A way of tube regulation was found that provides incredibly high performance but mostly are inexpensive components combined in a clever rather than 'brute force' method. Better to be 'clever' and 'elegant' rather than throwing money at the problem. Yet the component cost is significant and does provide good value to the buyer." As for the bits I do understand, the sockets are all good quality, layout neat, the switches nice to use. Sadly the casework, though solid enough, really betrays the amps DIY origins - Joe is acutely aware of this and a redesigned case is next on the list to satisfy fussy types like me. Power output is pretty healthy at 35 w continuous, 10w more than the Gaincard that it will inevitably be compared with, and though it's no current-pump speakers over say 88 dbl will be fine - plenty of choice. Once you plug the JLTi into the mains the valve pre is permanently switched on, something which actually enhances valve life (no switch on/off stresses) and keeps it at it's optimum operating condition. Flicking the "Power" switch (I love those old-fashioned switches) only brings the power-amp on stream. It's important then that when the amp is first plugged in it should be left 'off' for 30 seconds so that pre-amp "thumps" finish before the power amp supplies the speakers. Apart from this minor operational quirk the little amp never missed a beat in the 4 months (sorry Joe) I kept it. My main system is an 8 watt SE/Horn outfit costing about 25 times the JLTi so was hardly compatible with what is in reality a small transistor integrated. I duly scuttled off to a friend, and speaker designer/builder to try the thing in his system. His normal amp is some 500e Marantz thing which he likes a lot. I left the JLTi with him for a couple of weeks then we had a long couple of sessions together to pin down what was going on. So compared with a good budget+ integrated what did it do? Well in some areas it slaughtered it :-) Though the Marantz had a wider stereo width it was hardly a soundstage - the JLTi gave you the acoustic of a venue where the Marantz gave a rather dramatic left/right spread, OK with rock but when anything that was well recorded came on the difference was clear. Then there was the way the JLTi treated acoustic instruments and the human voice - beautiful, natural, flowing. The sonic signature of each instrument kept intact, an electric piano easily spotted from the real thing, not something the Marantz excelled at. There was a downside. Turn up the wick and the attack and sharpness of the Marantz could make the JLTi sound a bit lost and woolly - dynamics were reduced to the point where my friend was unsure about which amp he preferred, given the difference in price he was happy with the Marantz. Here we have shades of my Gaincard review - the JLTi was OK until the going got rough. However later my friend came over with his speakers - my 8 watt SE clipped horribly even at quiet conversation levels so I'm sure that here we had a speaker that was both inefficient and with a pretty evil impedance curve. Still, with little choice in it went. Well it was instructive in one respect - the Gaincard had sounded a little flat and boring with these speakers, the JLTi had no such problems. The dynamics that were squashed in my friends system were released unhindered. It also produced a lovely valvy sound - and I mean that in the positive sense of 'natural, warm and powerful', sounding not unlike the "Son of Pharao" amp it replaced (at 7000e!). But to write a review from this would be a fraud, so far I'd given it unsuitable speakers and then a cruddy room. There was only one thing to do and that was to go from the sublime to the ridiculous (or the other way round) and rip apart the main system and see how it coped with driving my Loth-x Polaris horns, speakers designed specifically to partner very low powered SE valve amps. So with a bit of heavy lifting the Audionote M3 and Quest Silver monoblocks were pulled out and a little transistor integrated costing about 1/12th of their price slotted in as replacement. I know what you are all thinking "he's going to tell us it blew the AN's away...". No 'fraid not. BUT the damn thing worked! If someone had told me that a 1100e transistor integrated was going to dovetail with my horns I'd have chased them away. But the truth is that if someone was going to spend 8000e total on a pair of speakers and amp that JLTi/Polaris mix would take some beating - it really sang! The first surprise was that I would never have spotted it as a transistor amp. I know it's got valves there but it's still silicone driving the cones and with only one exception (the Audio Consulting 'Rock Solid' at 7000e) no transistor amp has been totally happy with them, always managing to sound grainy/pushy. Inevitably the comparison with the AN's is totally unfair. But it does serve to illustrate a couple of points. The lovely natural ability hinted at before remained, this is an amp you could listen to all day - I don't mean it's 'rolled off' or anything like that because that irritates after 5 minutes. No it's even handed and consistent, it doesn't jar you as it picks out certain aspects of a piece, neither does it leave you trying to pick out the words of a song you know you should be able to hear. With the Polaris the huge headroom available made it an excellent rockers amp in total contrast to its performance against the Marantz. Where it fell noticeably behind the AN pairing was in the areas of ultimate resolution, speed and atmosphere/ambience. It did sound a little rounded compared to the AN's and where they threw a big hall around the Sheffield Labs 'King James' the JLTi made it all a little small, rounder and softer. It did produce a good acoustic by other standards but here it's just asking too much to take on the AN's. The bottom line though is that I was happy sitting in front of it - yes it missed things, but it didn't do anything wrong and remained musical and entertaining at the same time. If I'd never heard the AN's I would have been perfectly satisfied. Sadly, my wife agreed and muttered darkly about why-I'd-wasted-all-that-money-when-the-little-amp-that-was-so-much-easier-to-use-was-so-much-cheaper??? Then she could buy that new clarinet she had her eye on... (you've all been there...). Even I had to admit that if this amp had arrived a year ago, when my system was powered by an EL34 valve push/pull pre/monoblocks retailing at about 5000e I think the JLTi might well have given it a very hard time. Memory plays tricks, but the lead the AN's had over the JLTi was very similar in both distance and quality to the one they had over my old Audion pre/power. Given the similar power output the two would have been direct competitors - not what someone would expect given the price difference. I said before that there is a "quiet revolution" going on here. If amps like the JLTi are able to perform at this level with very expensive speakers it may force us to rethink our attitude to system building. I've personally rather bucked the source/amp/speakers order of component importance because I believe that often it is the interface between speaker and room that is the make or break of a system. If your speakers don't match then no amount of upgrading elsewhere will solve the problem. As speakers are big, heavy, difficult to sell/ship, expensive items that last practically forever, it seems logical to find speakers that work in your environment and then stick to them long term. This is what I did when I shelled out for my Loth-x Polaris speakers three years ago, only recently buying amplifiers of similar cost. So if we see speakers as the longest term investment in a system then it makes sense to spend more than conventional wisdom dictates. The downside of this argument is that such revealing speakers will emphasis faults elsewhere, particularly with harsh amps with poor control. With the advent of amps like the JLTi the logic becomes much more palatable as it is perfectly capable of matching true high-end speakers without embarrassing itself. But once you've accepted that, then our budget for a system may be split in a totally unconventional way e.g. 40% source, 10%amp, 50% speakers. In fact the JLTi shines brightest in such a system. Plug it into a budget+ set up competing with a decent integrated and you may wonder what the hype is about, it's refinement, poise and ability lost. Thank you Geoff for a well-rounded review. Yes, this is about a "Quiet Revolution" (like that and will quote it) that is taking place and the mainstream audio rags are yet to catch on. Maybe that's why we have the Internet? I noticed that you did take up my challenge, not to be afraid to put it with the very best equipment available, and you duly took it to the umpteenth degree. No amp at any price is perfect and one at the JLTi's price is not either. Like all decent amps, it should be judged in the ultimate sense and not pigeon holed. Only when partnered with quality equipment enables one to make that call. I'm happy to see that you did just that. 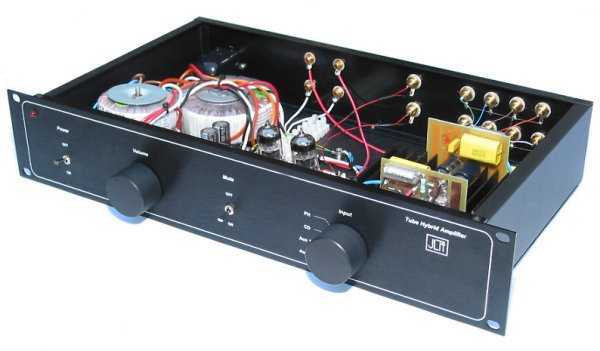 The JLTi was designed to give a high performance tube-like sound at reasonable cost It should NOT be taken as a budget amp (as an upgrade from a NAD as was suggested by another review), just because it seems to be a near budget price for an amp with tubes. Most current owners use it with far more EXPENSIVE speakers, many times what they paid for their JLTi. I often do demonstrations of it in my own system costing twenty times as much. It never fails to deliver musical, tube-like sounds. So maybe my new catch-cry will be: "Not a Budget Amplifier, just a Budget Price." The new and significantly improved JLTi Mark 2 model is now available. It doubles the size of the toroidal transformer again, has much improved casework and uses cryogenic treatment extensively. Check the new review on TNT-Audio, now available.